These slow-cooked buffalo almonds are ideal for a tasty (and spicy!) low carb snack! 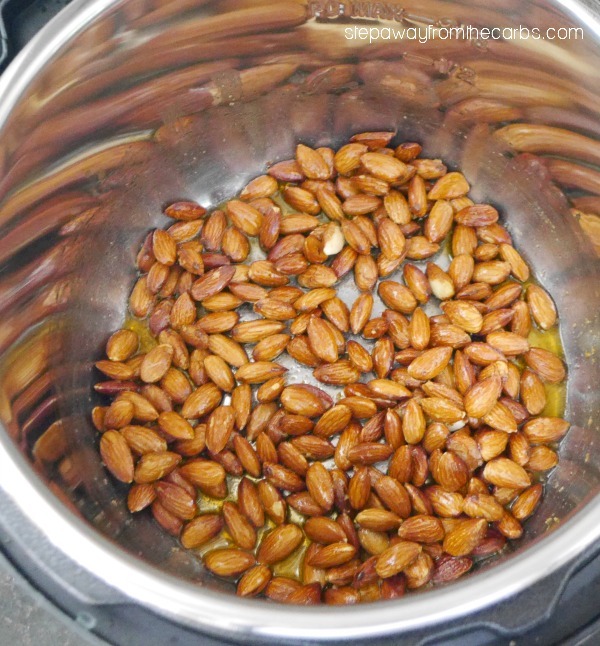 The last low carb nut snack I made in the slow cooker was these delicious Cocoa Nuts. These Buffalo Almonds are a variation on the same theme – but instead of sweet cocoa this snack is loaded with buttery and spicy buffalo sauce flavors. Add melted butter, hot sauce and whole raw almonds to a slow cooker bowl. Note: If you’re making this recipe in an Instant Pot, you can use the sauté function to melt the butter – which is super convenient! Just melt it first, then add the hot sauce and almond! Stir well to coat every nut in the sauce. Cook on low heat for 2 hours. 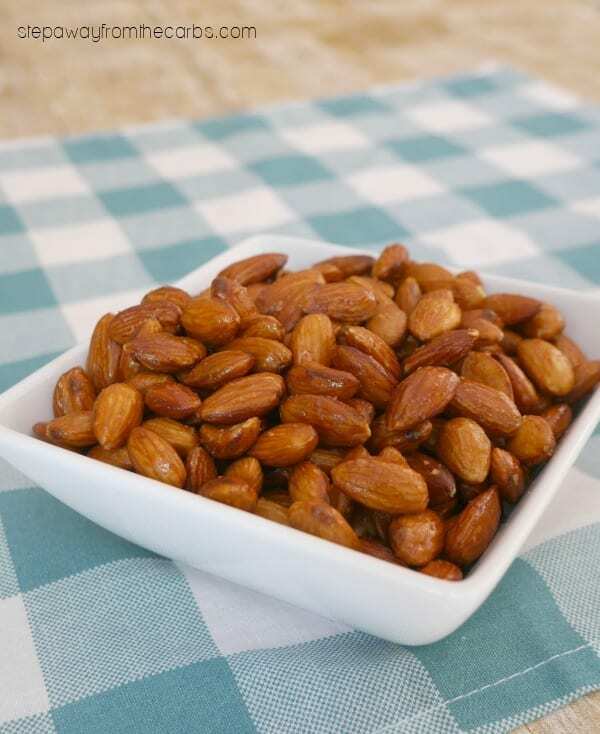 Spread the almonds onto a baking tray lined with baking parchment and sprinkle with a little salt. Allow the nuts to cool. Enjoy the buttery and spicy nuts as a snack any time! They are super portable so are great for on the go! Store in an airtight container. 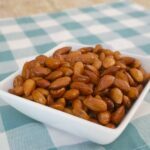 These spicy Buffalo Almonds are great for a low carb and keto snack! 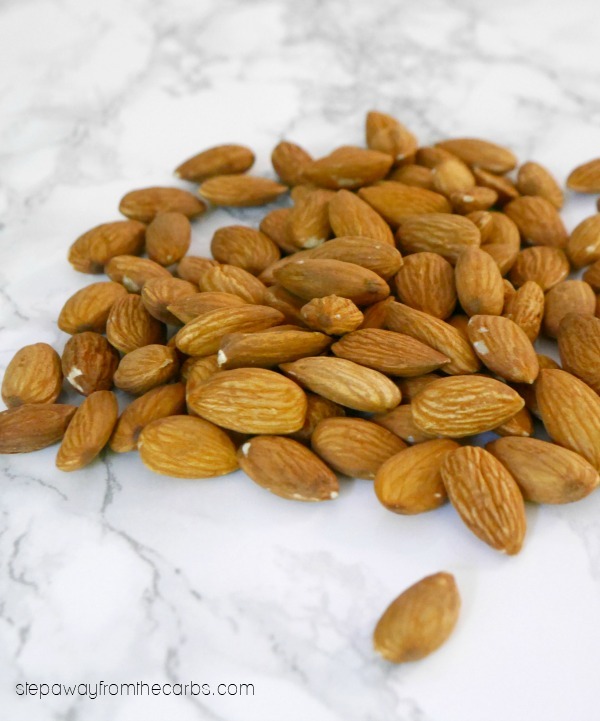 Add the almonds, melted butter and hot sauce to a slow cooker or Instant Pot bowl. Stir well to mix. Spread the nuts onto a baking sheet lined with parchment paper, and sprinkle with salt. Leave to cool. Georgina, that sounds like my kind of snack! Totally trying this out. I haven’t got a slow cooker though – do you think I can do it in the oven at say 150 Celsius, covered? Yes I should think they would be delicious cooked that way! Let me know how it goes! I’m sort of addicted to buffalo sauce! I have not used my crock pot for flavored nuts before, but I can’t wait to give this a go! Oh, my! My husband would be all over these, Georgina. I love the idea of cooking them in the crock pot. I have never used mine that way before. Definitely trying! This is such a great idea! We run a pub themed school fundraiser in the spring. These would be perfect to serve at the bar. Great idea for a low carb snack! Love the kick that buffalo sauce gives! Yum! My whole family loves Buffalo flavored things! We used to live just south of Buffalo, NY, where the whole “Buffalo” flavor began! Love the recipe, but what’s a serving? How many servings in this recipe? As per recipe card, there are 8 servings. 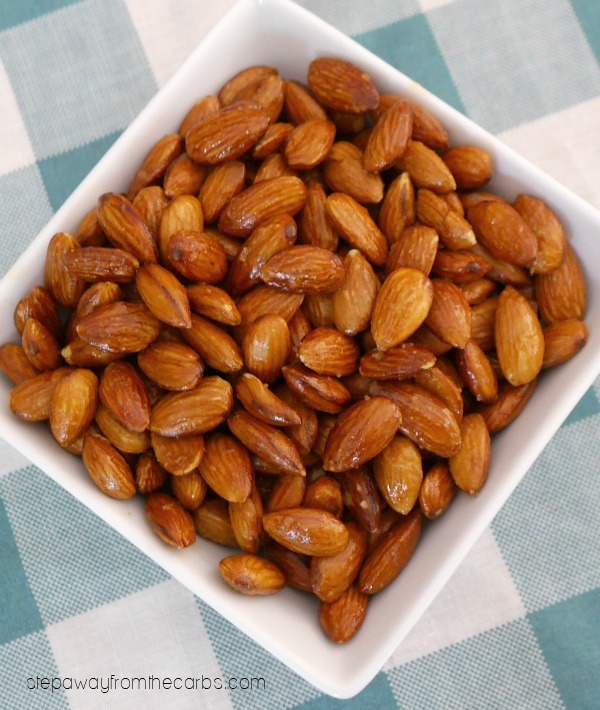 With 10oz almonds that works out to 1¼ oz per serving – which is roughly equal to 28 almonds. Hope that helps!